A complete guide to Scotland’s first formal canoe trail. Out of stock, will post availability info soon. This guide is an essential resource to help you plan your journey through the Great Glen across Scotland. As well as the calm waters of the Caledonian Canal there are the challenging open waters of Loch Lochy and Loch Ness. Here you will find advice on how to deal with the conditions as well as food, equipment, safety, communication and rescue. The best craft for the adventure are open canoes, sea kayaks or touring kayaks. There is advice on choosing the right craft, loading it, and the best ways of carrying it over portages. The coast to coast route can normally be completed in three to five days. We have split the route into a five day expedition and each day is described in detail, including camping and other forms of accommodation. There are also numerous single day options and, for the more advanced paddlers, suggested routes that link stretches of river with lochs and canal sections. The post of Project Officer for the Great Glen Canoe Trail was always going to be exciting and challenging, while working with five publicly-funded organisations has itself been interesting! The two year post has included everything from negotiating with local landowners and passing on key information to the canal’s lock keepers as well as supervising contractors’ work. It has been non-stop and although my two years have passed very quickly I have made many friends and hopefully left a long-lasting legacy for all paddlers when they visit the Great Glen. 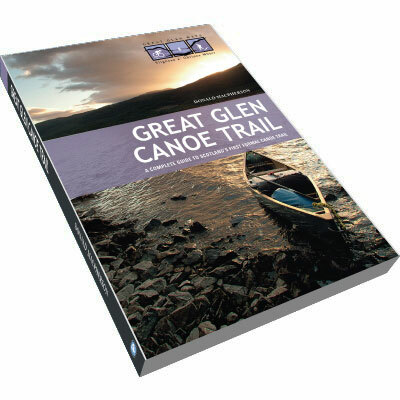 I do hope that my work and knowledge of the Great Glen, as demonstrated in this guidebook and online at www.greatglencanoetrail.info will help you to plan a safe journey through the Great Glen. It has been a privilege to promote the Scottish Highlands as a fantastic paddling destination during this project and I look forward to seeing and hearing all of your Canoe Trail adventures in the near future. Stay safe, respect and enjoy the trail! PDF requires Adobe Acrobat Reader. Just finished reading through this very comprehensive publication. An ideal resource for anyone planning on taking on the challenge of a multi-day coast to coast paddle, a weekend’s outing or just a day paddle. It’s packed with well researched information that will be invaluable to paddler’s contemplating their first “Expedition”, and lots of detail that will allow seasoned vets to make plans to get the most out of their trip. I’ll certainly be consulting it when planning my next Great Glen trip and it’ll be tucked into my map case during the journey. Apologies but you have to be logged in to leave a review; we have to do this to avoid spam.